Growing up in Scotland in the decades between two World Wars, Eduardo Paolozzi was part of a society where nothing was wasted and everything was utilised. Recycling and reusing was a habit that stuck with Paolozzi, absorbing the artefacts of popular culture he surrounded himself with and redeploying them to create his art. From a young age Paolozzi drew on pages torn from magazines and comic books, which he assembled into large scrapbooks. He maintained this method of working throughout his time at St Martin’s and Slade School of Art in the 1940s, cutting and pasting glossy advertising images with long strips of Sellotape. After graduating, Paolozzi spent three years in Paris, where he was introduced to the work of the Dadaists and Surrealists, as well as meeting contemporary artists such as Alberto Giacometti and Jean Dubuffet. Upon returning to London, these diverse experiences continued to influence Paolozzi’s work. As a founding member of the Independent Group, he delivered his now-famous ‘Bunk’ lecture at the Institute of Contemporary Arts in London, illustrated with a series of collages. 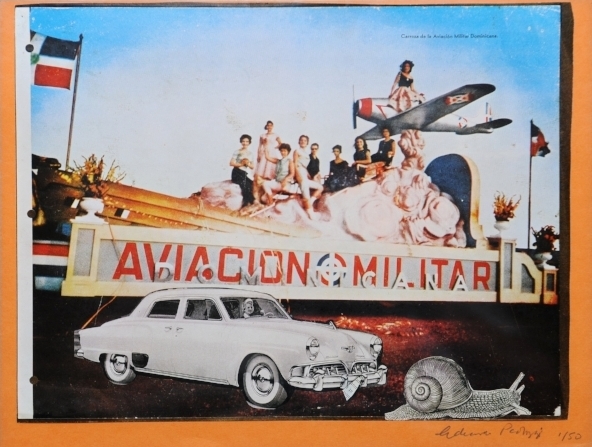 A logical extension of Duchamp’s ‘ready-mades’, these collages drew on sources of popular culture but advocated their serious study as art objects. Paolozzi explored many recurring themes throughout his career, blurring the line between high art and popular culture, the human condition, technology, mass production, consumption and waste. The prints in this exhibition span the whole of Paolozzi’s oeuvre, from the ‘Bunk’ series described as the ‘prototypical works of Pop’, to the machine aesthetic of the Blueprint pictures that inspired his mosaics on the London Underground. A major retrospective of Paolozzi’s was held at the Tate Gallery in 1970, and he was elected to the Royal Academy in 1979. His work is held in major public collections around the world, including at the Scottish National Gallery of Modern Art where a recreation of his studio is on permanent display.